The Knoxville Nationals is not only one of the oldest events in sprint car racing but it has become the biggest and most prestigious. 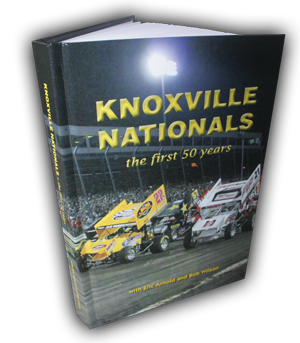 This book covers the First 50 years of the Knoxville Nationals from 1961-2010. There is one chapter for each year, the finish of each years championship feature, statistics, and a complete list of drivers that has competed in the Nationals. It is a hard-bound book with 303 pages and over 200 photographs, including sections with color photos. For only $40 the book can be yours! For questions about the book or ordering information e-mail us at knoxvillenationals50@gmail.com. 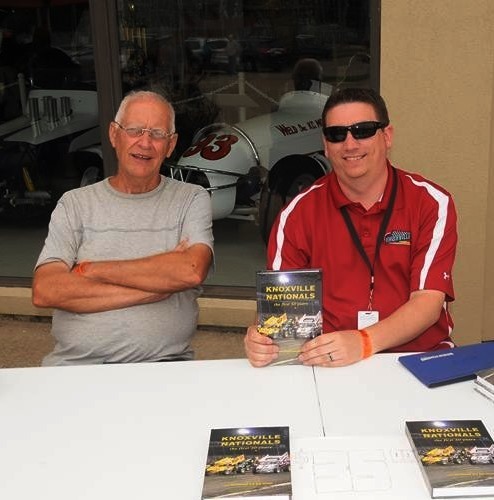 The books authors are a couple of geeks when it comes to the Knoxville Raceway and the Knoxville Nationals. Bob Wilson has seen every Knoxville Nationals and has been the track historian at Knoxville Raceway for decades. Bob worked for the track from 1983-2010 writing the official press releases and race results and was inducted into the Knoxville Raceway Hall of Fame in 2011 for his service. Bob wrote chapters 1961-1985. Eric Arnold has been going to the races at Knoxville Raceway since he was 3 years old in 1977 and has seen every Knoxville Nationals since 1981. Eric is also a Knoxville Raceway historian, is the track's Blogger and Social Media Commentator, and is a writer for Flat Out Magazine. Eric wrote chapters 1986-2010. This is an important piece of history that needed to be recorded for the ages.